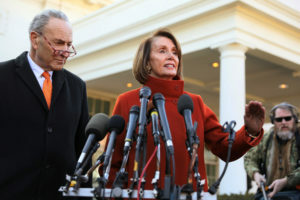 WASHINGTON — House Speaker Nancy Pelosi and Senate Minority Leader Chuck Schumer will give the Democratic response to President Donald Trump’s remarks to the nation Tuesday on his proposed wall on the U.S.-Mexico border. An impasse over wall funding has led to a partial government shutdown, now in its third week. Pelosi and Schumer have flatly refused to pay for the wall. They said Tuesday they will deliver their response to Trump after his address at 9 p.m. EST. Trump says there is a security crisis at the U.S.-Mexico border that can be addressed only by spending $5.7 billion on a wall as a way to prevent people from crossing into the U.S. illegally.